Gerrit Roon’s treatment of light, and balance of color and composition has put him at the forefront of contemporary South African landscape painting artists. His range of subject matter varies from wildlife, landscapes of villages and hills to his famous coastal scenes. Although interested in drawing and sketching from an early age, Gerrit never really benefited from formal training and remains largely self-taught. This clearly gives a uniqueness of interpretation and style, which permeates his work. Gerrit is one of those talented people who knew exactly what he wanted to do. In 1958, as a young man, Gerrit emigrated from Holland to South Africa and was instantly impressed by the scenery and quality of light. He began experimenting in oils, watercolors and pastels before settling on his chosen medium of oils. Gerrit was one of the founding members of the Artists Market and still plays a crucial role in teaching and promoting the talent of new and young artists. Many visitors to South Africa are particularly drawn to Gerrit’s work as it combines the elements of lush treatment of South African scenery with expert technique. In style, Gerrit uses much paint and many colors in a manner in which post Impressionism creates a realistic image from a small or great distance. Close up, his technique of combining many colors in impasto form appears not to form a recognizable subject. The work is slow and deliberate, building layer upon layer until the desired effect is created. This is particularly true of his boats in West Coast harbors and under repair. Gerrit is most famous for his small and large Table Mountain scenes, blue gums in the high veld and his beloved fishing boats/harbor scenes. 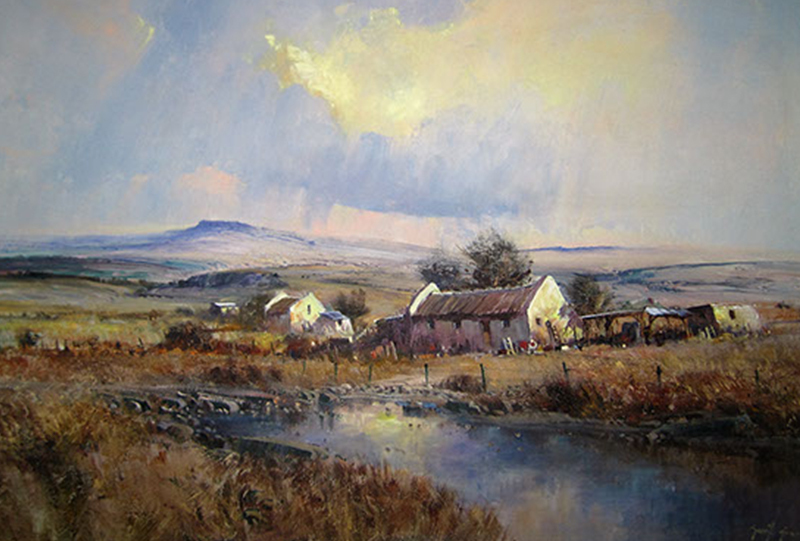 Those who have collected this respected South African landscape artist’s work in the past have been pleased to see them increase in value – a true measure of quality of work and uniqueness of talent.